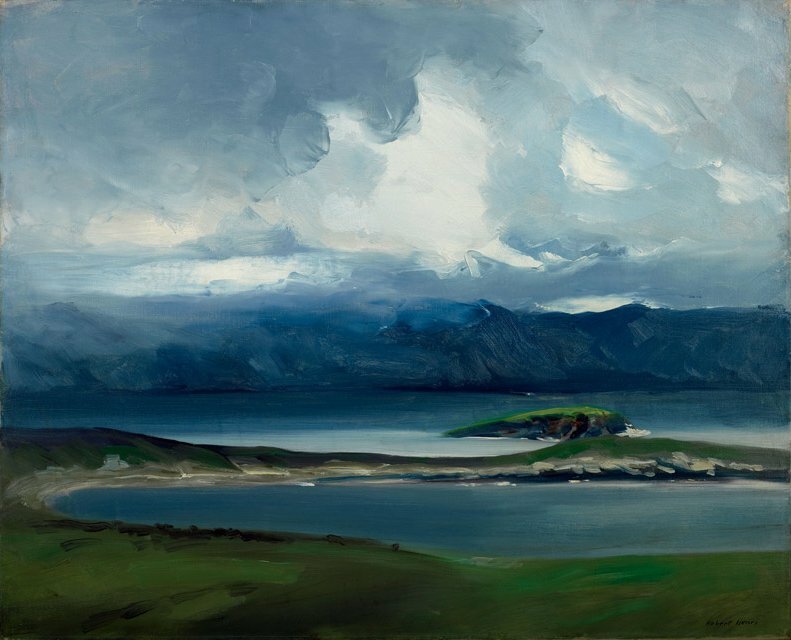 Robert Henri (1865–1929), West Coast of Ireland (1913), oil on canvas, 66 x 81.3 cm, Everson Museum of Art, Syracuse, NY. Wikimedia Commons. Robert Henri (1865–1929) was a colleague, friend, and rival of William Merritt Chase, and one of the most influential painters in America in the early twentieth century. He was born Robert Henry Cozad, in Cincinnati, Ohio. His father was a property developer, and soon moved the family to Nebraska, where they were inaugural residents in the new town of Cozad. However, his father became embroiled in a dispute over land, leading to Cozad Senior shooting the other man. Young Robert fled to Denver, Colorado, where he was joined by the rest of the family. He changed his name to Robert Earl Henri and posed as an adopted son. When he was eighteen, the family moved to New York City, and on to Atlantic City, New Jersey, where he started to paint. His formal training began at the Pennsylvania Academy of the Fine Arts in 1886. Two years later he went to Paris and studied at the Académie Julian under William-Adolphe Bouguereau, but failed to gain entry to the École des Beaux-Arts. Before he left Europe in late 1891, he had also visited and painted in Brittany and Italy. 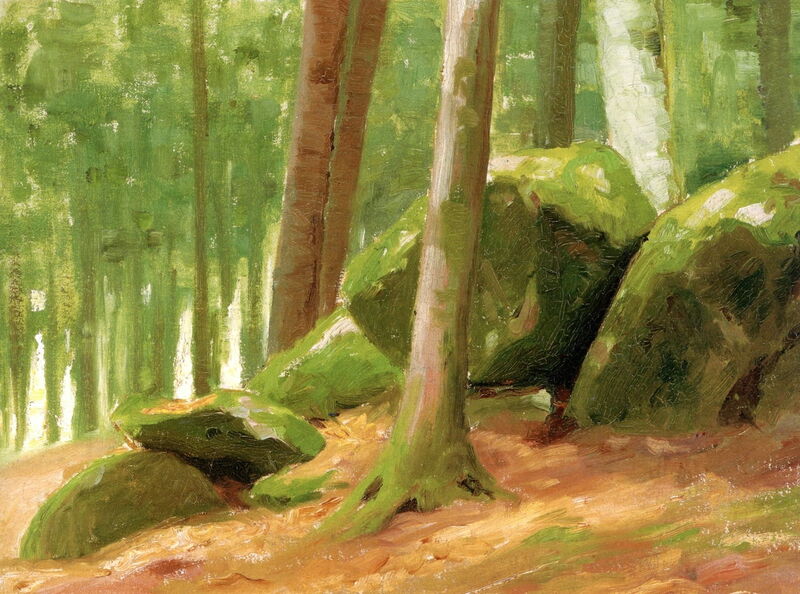 Robert Henri (1865–1929), In the Woods (c 1890), oil on panel, 26.7 x 36.4 cm, Farnsworth Art Museum, Rockland, ME. The Athenaeum. In the Woods (c 1890) shows the influence of Impressionism on his paintings of this period, while he was still in Paris. Robert Henri (1865–1929), Café du Dome (On the Boulevard Montparnasse) (1892), oil on canvas, 66 x 81.3 cm, Private collection. The Athenaeum. 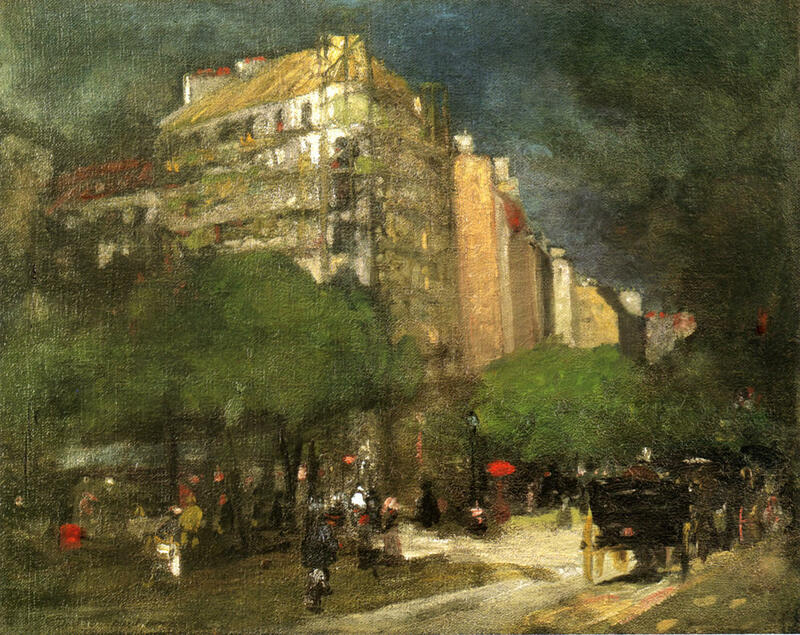 Café du Dome (On the Boulevard Montparnasse) (1892) is an example of his early views of Paris. Back in the US, Henri returned to the Pennsylvania Academy of the Fine Arts, and the following year started teaching at the Philadelphia School of Design for Women. Robert Henri (1865–1929), Beach at Atlantic City (1893), oil on canvas, dimensions not known, Phoenix Art Museum, Phoenix, AZ. Wikimedia Commons. 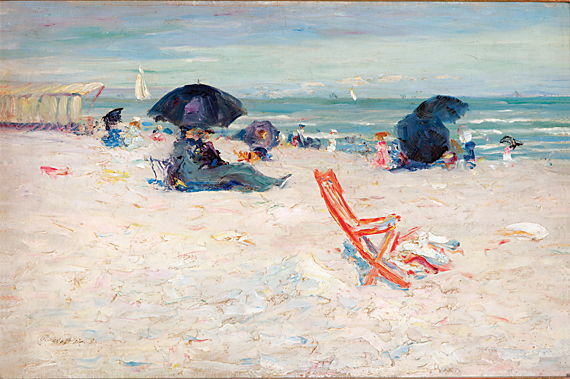 Although this image of his Beach at Atlantic City (1893) is very small (it is the largest that I have been able to locate), this view shows how much his early style was influenced by French masters such as Manet and Monet. In the mid-1890s, Henri moved away from the Impressionism which he had valued so much during his training, referring to it as the “new academicism”. He urged others to join him in seeking fresh and gritty subjects in contemporary American cities, so becoming a founder of the Ashcan School. 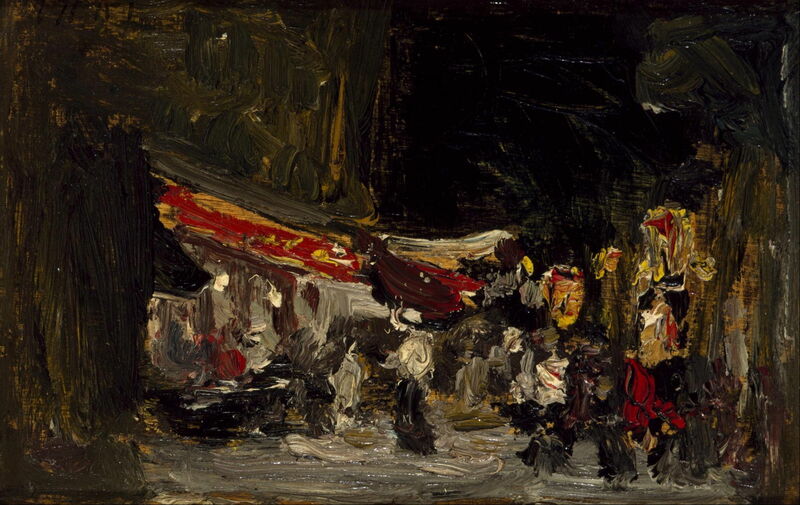 Friendship with the Canadian painter James Wilson Morrice introduced Henri to sketching en plein air on small panels or pochades, a technique which he used to make quick oil sketches in cities. He was successful in having portraits accepted for the Paris Salon of 1896 and 1897. In 1897 he also had a solo show in Philadelphia, which attracted the attention of William Merritt Chase, who introduced him to the art world of New York, and invited him to teach at Chase’s own art school in New York. Robert Henri (1865–1929), Night on Boardwalk (1898), oil on wood, 15.6 x 10.2 cm, Museum of Fine Arts, Houston, TX. Wikimedia Commons. His nocturne Night on Boardwalk (1898) shows how far his mature style had departed from his early Impressionism. Robert Henri (1865–1929), Sudden Shower (1898/1902), oil on canvas, 82.2 x 66 cm, Museum of Fine Arts, Houston, TX. Wikimedia Commons. Sudden Shower (1898/1902) was either completed just before or soon after that extended honeymoon in Europe. Robert Henri (1865–1929), On the Marne (1899), oil on canvas, 66 x 81.3 cm, Private collection. The Athenaeum. 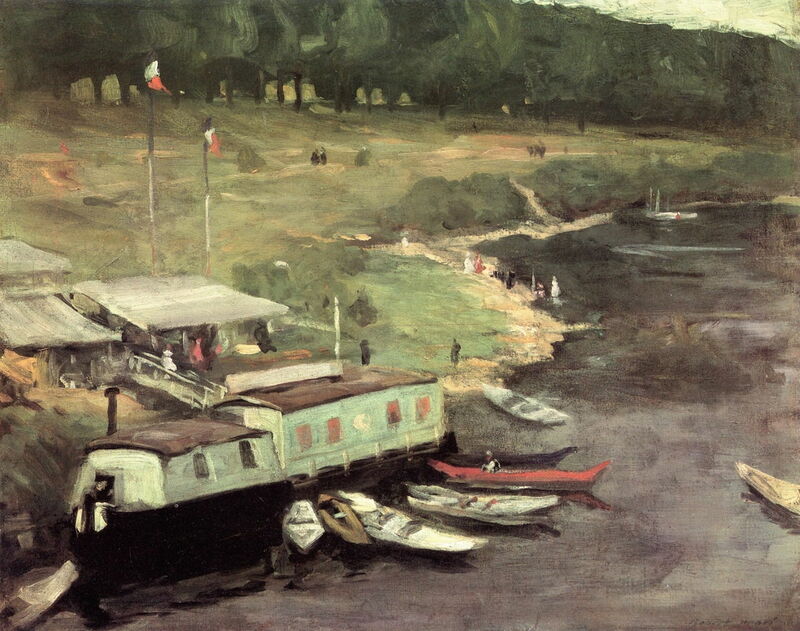 On the Marne (1899) pays homage to Impressionism in showing some of its most important scenery, the river Marne, which was a popular motif for several of Cézanne’s paintings. This view is unusual in its elevation above the river, which perhaps signifies his determination to move on. Following his return from Paris, in 1902 he started teaching at the New York School of Art; his more notable students there included Joseph Stella, Edward Hopper, Rockwell Kent, and George Bellows. Robert Henri (1865–1929), Spain (1902), oil on canvas, 65.4 x 81.3 cm, Private collection. The Athenaeum. 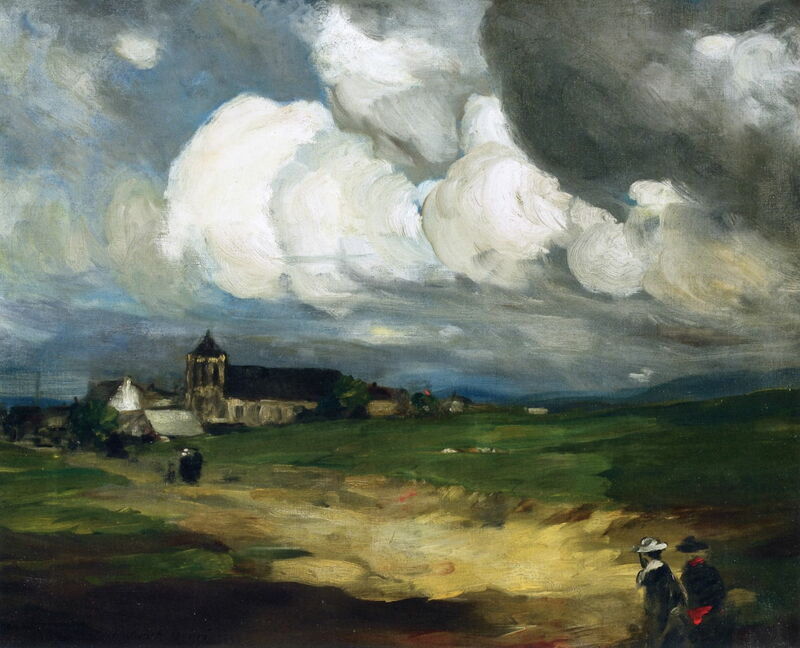 His Spain (1902) has a wonderfully dramatic sky, which confirms his great skill as a landscape painter far from the streets of New York. 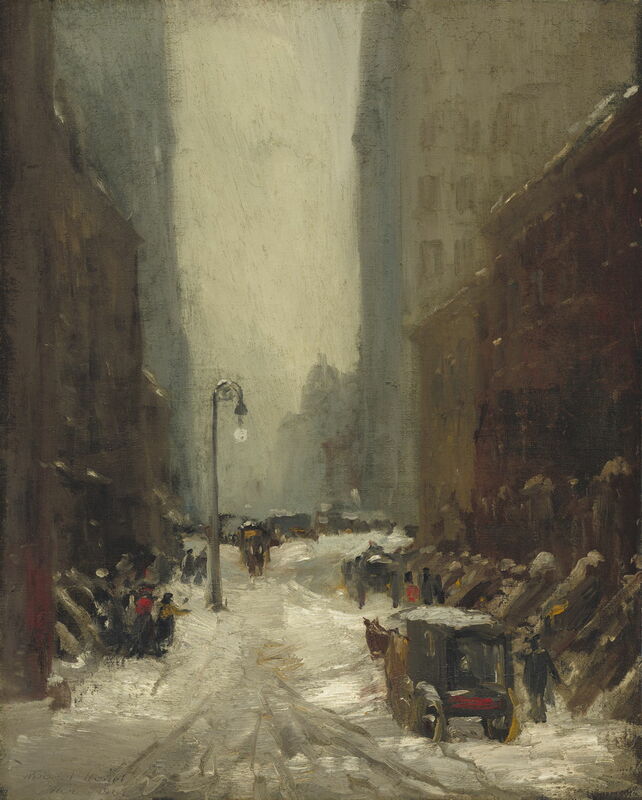 Henri was particularly eloquent when painting views of New York City in harsh winter weather, as in his Snow in New York (1902). This was dated to 5 March 1902, and was most probably painted in front of the motif, in a single session, using the techniques he had learned from James Wilson Morrice. 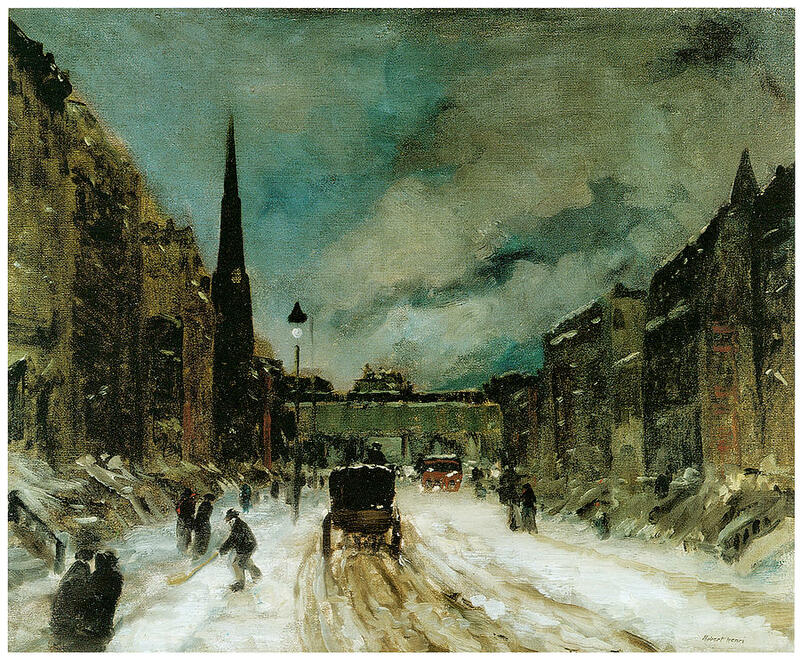 Street Scene with Snow (c 1902) is a more developed view of the city in winter, here in a more residential district. 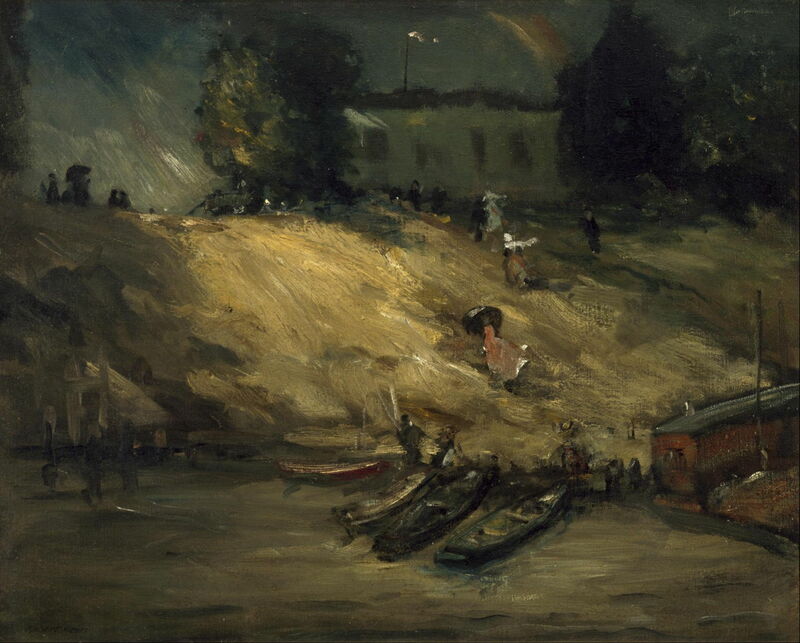 Robert Henri (1865–1929), Landscape Sketch at Escorial (1906), oil on panel, 19.1 x 24.1 cm, Portland Museum of Art, Portland, ME. The Athenaeum. Landscape Sketch at Escorial (1906) appears to be a plein air pochade painted outside the city of Madrid, in the hills near the Escorial, home to many old master paintings. In 1906, he was elected to the National Academy of Design, but walked off the jury for the following year’s exhibition, accusing other jurors of bias. 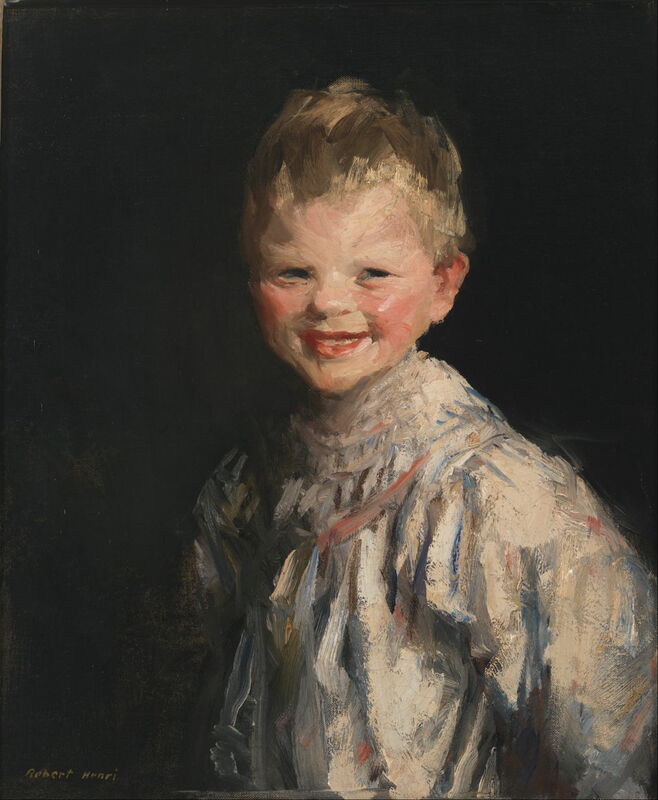 Robert Henri (1865–1929), Laughing Child (1907), oil on canvas, 51.4 x 60.3 cm, Whitney Museum of American Art, New York, NY. Wikimedia Commons. Laughing Child (1907) is one of several portraits which Henri painted of the children he met in cities and among the poorer classes wherever he went. This was one of his paintings which were exhibited at the show 8 American Painters, organised by Henri as a response to his problems with the jurors at the National Academy of Design. It was attended by over seven thousand visitors, and more than $4,000 worth of art was sold. This painting was bought by Mrs Gertrude Vanderbilt Whitney. Robert Henri (1865–1929), The Blue Kimono (1909), oil on canvas, 195.6 x 94 cm, New Orleans Museum of Art, New Orleans, FL. Wikimedia Commons. Henri did not arrive at his The Blue Kimono (1909) through the Japonisme which had accompanied Impressionism, but with the rising numbers of Japanese who were becoming part of the rich cultural mix in contemporary American cities. It presents an obvious visual puzzle, though: the lower part of the woman’s kimono is not blue, but chocolate brown. I do not know if this was intentional, and represents the mud sprayed on from the streets in wet weather, or if this is the unintentional result of changing colour in a pigment. In 1907, New York audiences were shocked by Richard Strauss’s opera Salome (1907), based on Oscar Wilde’s play. This inspired Henri to invite a Mademoiselle Voclexca to perform the notorious Dance of the Seven Veils in Henri’s studio, which he then interpreted into a series of paintings, including this Salome (1909). He had long been influenced by Rubens’ portrayals of the sensuous powers of women, particularly in his Marie de Medici cycle (1621-1625). In 1910, he organised the Exhibition of Independent Artists, which was the first unjuried show in the US which did not award prizes, and was modelled after the Salon des Indépendants in France. Although it was well attended, on this occasion sales were poor. 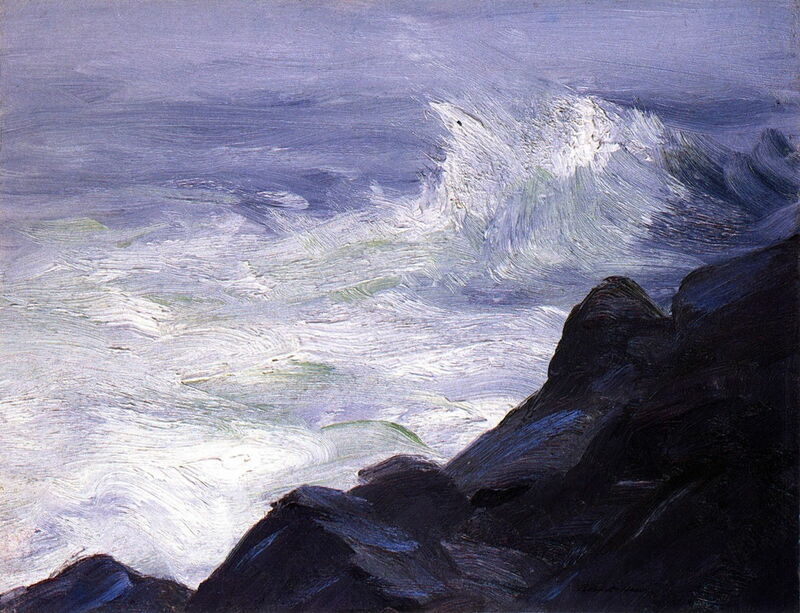 Later in his career, Henri took his pochade gear out of the city more, particularly on the wild coast of Maine, where he painting his Marine – Break over Sunken Rock, Storm Sea (1911). He exhibited five paintings at the (in)famous Armory Show in 1913, where he openly stated that he thought new European art would overshadow the non-representational American works shown there. This left Henri and remaining American realists in a difficult position, as successive waves of Modernism started to sweep through art, and representational painting fell from the avant garde. 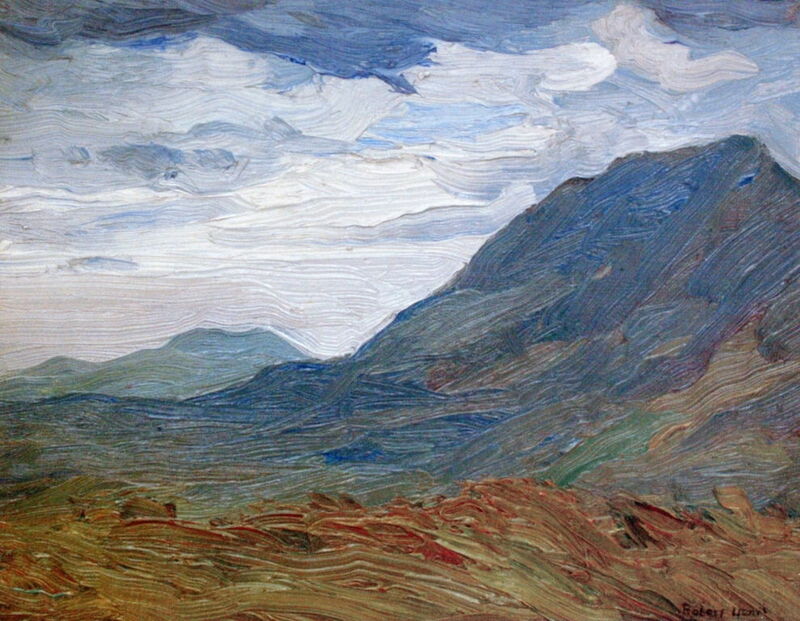 In 1913, Henri rented Corrymore House, on Achill Island, on the west coast of Ireland, where he painted the local children and the superb skies, as in his West Coast of Ireland (1913). This is my favourite of all his paintings. He started teaching at the Art Students League in New York in 1915, then the following year, as if to affirm his belief in the future of representational painting, he began travelling to Santa Fe, New Mexico, to paint its unique light and scenery. 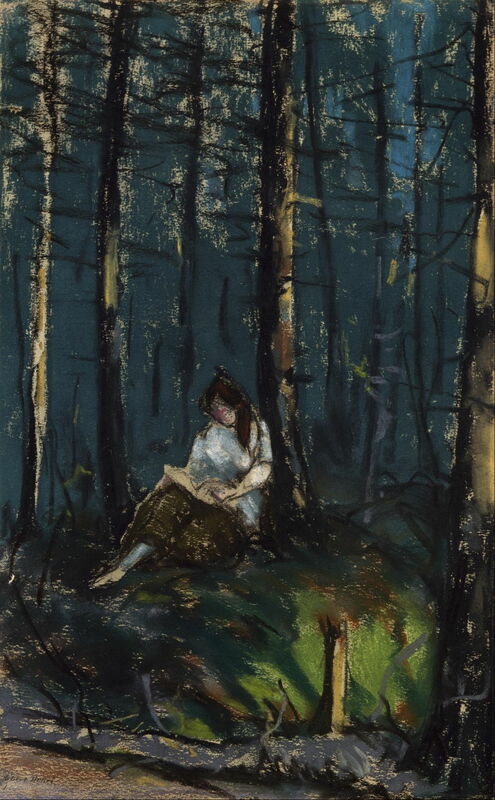 The Reader in the Forest (1918) is one of his few pastels which is still accessible. 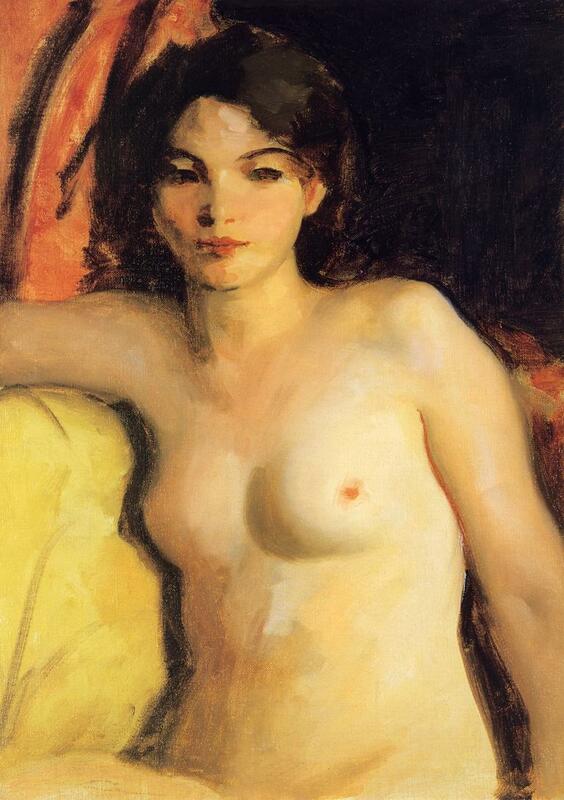 Robert Henri (1865–1929), Doris Trautman (1928), oil on canvas, 71.1 x 50.8 cm, Private collection. The Athenaeum. In the 1920s, he turned to studio models for a late series of nudes, one of the last of whom was the improbably-named Doris Trautman (1928). Later that year he became ill as the result of prostate cancer, and died in 1929. Posted in General, Painting and tagged Ashcan, Bellows, Bouguereau, Chase, Henri, Impressionism, Morrice, painting, Salome. Bookmark the permalink.